A coupon this HOT won’t last long – print 2x per computer. ShopRite – Tabasco, 2oz: $1.69. = $.69 after doubled coupon. Walmart / Target: Tabasco, 2oz: $1.34. Pay $.84 after coupon. Weis: Tabasco, 2oz: $1.50. Pay $.50 after doubled coupon. Wegmans: Tabasco, 2oz: $1.69. Pay $.69 after doubled coupon. Pizza! Pizza! CPK as low as $1.67 @ WEIS! 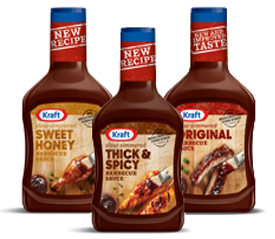 WEIS: FREE Kraft BBQ Sauce! Find at ShopRite, Weis & Walmart, regularly priced at $2.50, pay $1.50 with coupon.